This 4 col. x 15.5 inch ad is exactly what's needed to sell lots of grills (and lots and lots of advertising). With summer only 12 days away, it's prime season for buying grills. We've got the perfect direct-response print and Web ads you can sell right now to your local home centers or anyone else that offers them--unless another ad rep gets there first. These stunning 4 col x 15.5 inch print and 160 pixel x 600 pixel Web ads were based on a strategy we created and were produced by our own PAGE Cooperative-approved, overnight production service that many of you are using already (ask for ad number 1760). It was actually designed for our first "close them at the seminar" session we conducted for a newspaper client. We think it's a classic example of how to properly turn the raw information from a prospect into a serious ad strategy that'll generate a strong response the very first time the ad runs. Those of you who have taken our Response Oriented Selling course will immediately recognize the strategy behind it and how to sell the content, size, and frequency (even with an advertiser like this one, who was running 2x2's). First clear out all the incorrect theories an advertiser has about how to make money from a print and online newspaper. Second, replace them with better ones based on their own life experiences to maximize buy-in. Third, secure new information about the business, competition, and target customer. Fourth, create and present the ad, positioning it not as your idea, but the logical result of the new approach and the information the prospect gave you. In effect, you're proving the ad will work before it runs--the holy grail for ad reps and a really easy way to drive major revenue fast. The ad strategy itself is simple--put something at the top to grab the attention of those with grills on the brain this week, then a headline that addresses exactly what the target customer cares about--quality, price selection, and service, and then add enough substance to overcome the readers' tendency to go where they've previously gone (for many, the big chain stores). As you can see, the Web ad strategy mirrors the print one. After all, you're still going after people in the market to buy grills. They buy from one place rather than another for the same reasons. And they're just as skeptical, so don't skimp on your online advertising message. If you swap out the grills for air conditioners, they should fly off the shelves, too. 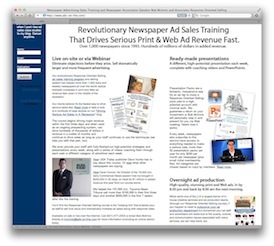 In fact, we recommend getting this first print and Web ad running and profitable for the advertiser at a frequency of at least once per week (and lots of impressions online), as that's about how fast the market turns over. Then, add a second ad running simultaneously for air conditioners. Or home and garden. Make sure you discourage your prospective advertiser from alternating the ads each week or you'll be missing all the people buying the products in the off weeks. This is what newspaper ad sales should be all about in this economy--ad reps analyzing a client's business and helping create effective advertising strategies that your (or our) designers can make look better, and then proving why it's going to work in the final presentation. Now get out there and sell some grill ads!